The EcoHitch® stealth hitch for the 2018 Volkswagen Golf GTI is designed to be completely concealed with a removable receiver, once it's installed. Rather than having to see an unsightly crosstube underneath your vehicle, you can remove the receiver to return the vehicle to its original factory look when the hitch is not in use. This stealth trailer hitch is just as sleek as your Golf GTI. Rated for 200 pounds tongue weight and 2,000 pounds towing weight, the EcoHitch for VW Golf GTI has the strength to keep up with any adventure you go on. *If you’re going to be towing and need trailer wiring, click here! Ensure your wiring harness does not drag on the ground by visiting our Eclipse trailer wiring bracket. With your stylish and sporty VW Golf GTI, there’s never a dull moment when you’re at the wheel. You need a trailer hitch for your VW Golf GTI that is just as unique as your GTI. A perfect example of how a hatchback can have tons of versatility, we’ve manufactured a perfect complement to your car with this hitch for 2018 Golf GTI. The best part? Only the receiver is visible when the car hitch is installed. 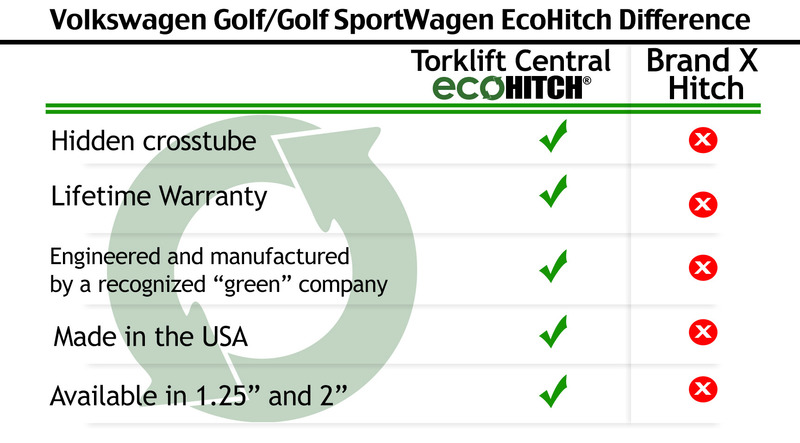 The EcoHitch® stealth hitch for VW Golf is engineered to meet stringent national SAE J684 standards and comes in a 2-inch receiver size. Our “Stealth” style EcoHitch gives you the ability to have an amazing ride in your Golf GTI without conceding style. This is because only the hitch receiver is visible once installed and when you’re not using the hitch, you can un-bolt and completely remove the receiver portion of the hitch for a clean, factory look. No one will know that you have a hitch installed unless you are in the process of using it for your adventure. With the Volkswagen Golf GTI EcoHitch, you can take your bikes and so much more! Why are hitch-mounted accessories more convenient? Unlike roof racks that interfere with aerodynamics, loading accessories using your EcoHitch eliminates vertical clearance issues and potential damage to your VW while loading and unloading. Take the easy route with your 2018 VW Golf EcoHitch!